UPDATE 1: Storm Hits Early. MASSIVE. Was up to 8.93 Kp!! Will the Storm Last Through Tonight? Watchers Will Have To Wait and See. 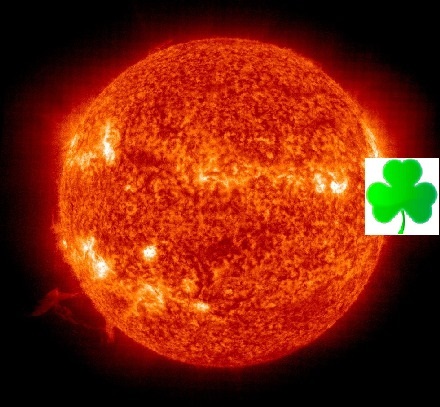 The watch begins at the time indicated above which will be the evening of St Patrick's day in many time zones. It should be noted that the beginning of the storm watch does not necessarily predict the arrival time of the CME cloud, rather it indicates that, within that 24 hour period, increased activity is expected. Real-time Aurora Borealis forecasts can be obtained at the Aurora Borealis Forecast page at Soft Serve News. NOAA estimates the CME currently headed towards Earth might produce a Kp number of 7, but that's never fully known until it hits Earth. Update: the last 24 hours of the 48 hour watch is rated "minor" (5 Kp).